​Archangel Ariel-“So what are you waiting on!" ​​Archangel Ariel-“So what are you waiting on!” I heard this clear enough this morning to wake me up and take down her message. I had been going through a bit of down time with my back asking, not so politely, to give it a little TLC. This had gone on a bit longer then I felt was necessary so of course I was trying to be patient and not feel guilty for not doing that I thought I should be instead of resting. When this message came through loud and clear this morning I thought, hummm - wonder what that’s about? I don’t know it you are like me but I started checking it out immediately. And to my surprise, my back is handling my moving around a lot better this morning. I’m familiar with Archangel Ariel and I have her essence in my blessed Egyptian Pure Essences I carry on my website, so I put a drop of that on, got my coffee and started listening to my inner self to see when I was led and I’m also inspired to share because I know this message and the following guidance is not only for me but for you also. 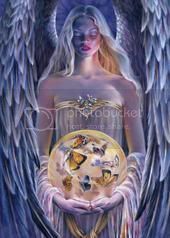 Archangel Ariel helps with: divine magic, environmentalism, especially concerning water bodies; manifestation, wild animal, fish, and birds-healing and protecting. From Doreen virtue’s book, “Archangels and Ascended Masters”: Ariel’s name mean “lion or lioness of God,” and is often associated with lions. You might start to see visions of references to lions when she’s around. She is also associated with the wind and oversees the sprites, the nature Angels associated with water. Ariel is very involved with healing and protecting nature and her animals of all types. I thought I would draw a card just for clarification as to what Ariel’s comment was about. The: card was from “Keepers of the Light Oracle cards”. Commander Ashtar-Call to Action. Take charge. Lead by example. Walk your talk. Ashtar is a multidimensional being who promotes truth, peace and harmony between the planets. You are receiving a call to action and being asked to step up and create the changes you want to see in the world. Divine inspiration is all around you and Ashtar and his legion of cosmic Angels are standing by to offer you loving support. Know that you are being encouraged to be honest, assertive and true in a loving way. You may feel your ego trying to hold you back, but know that when you take the first step, the next one will soon follow. Take some time to connect with the universe by looking up at the stars, knowing that there are living beings of light gazing down on you. You are not alone. Goddess Isis is one of my main guides, so of course I drew a card from the “Isis Oracle” set. The card was Key of Life. Spinning the Ankh- the Key of Life. Meaning excerpt: the Ankh comes as a blessing and confirmation that new life is seeking to express itself through you now and encouragement that you allow this to occur. Something has started to be born, at this time, see it through. Don’t let it struggle to survive from lack of attention, care or belief that it will not be enough in any way or it will be too hard to handle once it is created. Stay with it, you are flowing in the right direction and you have spiritual support from the unseen worlds. If you are unsure of what your creative destiny may be or unaware of the exact nature of the new life being born through you now, remember that sometimes it can be a project or object, a relationship or a new human life, sometimes it is even a new way of thinking that is wise and heart centered and will be available for others to draw nourishment from as an alternative to more destructive and addictive thought patterns which humans can struggle with from time to time. One creative process that is common to all humanity is the birthing of the Soul light into form. The Mystery of the Ankh reveals that you can know for sure that you were growing spiritually at this time to allow more of your Soul light into your life. What this means is that no matter what the appearance of circumstances in your life right now, no matter whether you feel alive with creative flow, energized and happy, or whether you are in despair as your old world no longer brings you peace or seems to be falling away, your Divine Soul is behind it and the life is emerging. It is safe to trust and allow this process to unfold. This also brings a special message to those on the creative path. If you have a blank page or dry well for inspiration, if you are encountering doubt in your ability to create and flow, do not despair. The Ankh, Key of Life, promises fresh inspiration will return to you. You can be assured that just as the Nile floods, filled with life, after it has receded, so too will your creative flow soon return. Your creative days are not over! Your creative well will rise again, and you will feel beautiful, energized, and full of hope and promise, inspired to create. I posted the beautiful card pictures here too so you can enjoy them as I did this morning. ​Have a blessed and beautiful Monday.